Here it is: the triumphant return of the Bachelor’s Test Kitchen. I have finally been released from the purgatory of my old apartment, and with a new place and a new kitchen, I’ve been able to start cooking again. I am also excited because I got a new gadget: an induction cooktop, which is like a hot pad that uses electromagnets to heat your cookware much more evenly and reliably than a regular electric heating element. It might sound nerdy, and it is, but it gets insanely hot and the precise temperature control makes processes like deep frying much, much easier. For my first blog post in the new place, I decided to get back to basics and fix a dish that hits all the major Bachelor’s Test Kitchen guidelines: it’s cheap, simple, easy to clean up and super tasty. There’s also an argument to be made for it being healthy since it involves kale. 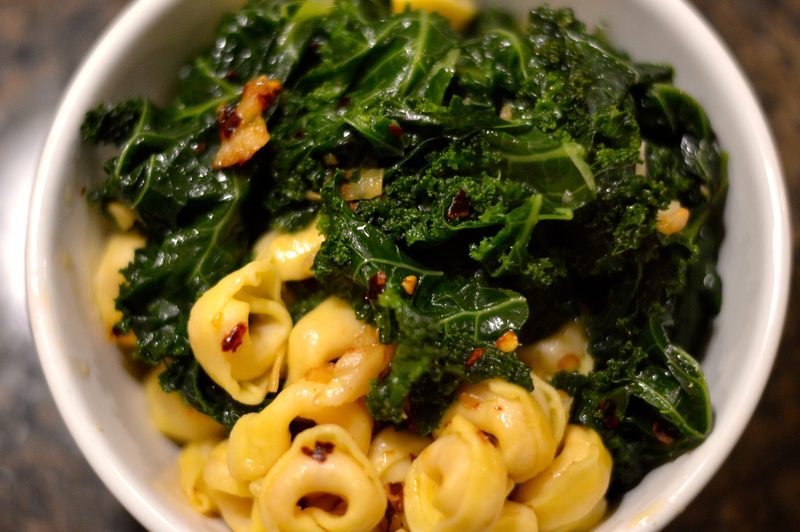 The reason this meal is so simple is that you can cook the tortellini and kale in the same pot; add the greens and the pasta to the water simultaneously, and they’ll become tender in about the same amount of cooking time. Since I was using my fancy new induction cooktop, the cooking time was super fast. Just make sure to use a hearty green like kale, collards or mustard greens; I’m not sure spinach would stand up to getting boiled this hard. Another reason this meal is so convenient is that you can make a ton of the pasta and greens, but less sauce or different sauces as you prefer. For this version, I fried quite a bit of garlic in olive oil with some crushed red pepper, then tossed some of the pasta in the pan after I drained it. Later, when I wanted to reheat it, I made the same “sauce” really quickly while the leftovers warmed in the microwave. I tossed the warmed pasta in fresh sauce and it was like a brand-new, fresh dish. Alternatively, you could make a tomato sauce or cream sauce later and have a completely different meal – there are lots of options. However, my little quick sauté of garlic and red pepper was delicious and won rave reviews from both my mom and girlfriend. That’s right, I ate this for dinner and then had enough left over to feed two extra people. People who would tell me if my pasta sucked. Bring a large pot of water to boil over high heat, then add a handful of salt. While the water comes to temperature, rinse and chop the kale and thinly slice the garlic. Add pasta and kale to salted, boiling water, following cooking instructions on the pasta package. While the tortellini and kale cook, fry the garlic and red pepper in the olive oil in a skillet over medium heat. Turn the heat to low if the garlic softens before the pasta is done. When pasta and kale are both tender, drain it into the sink. Turn the heat on the skillet back to medium and add your desired amount of pasta to it. 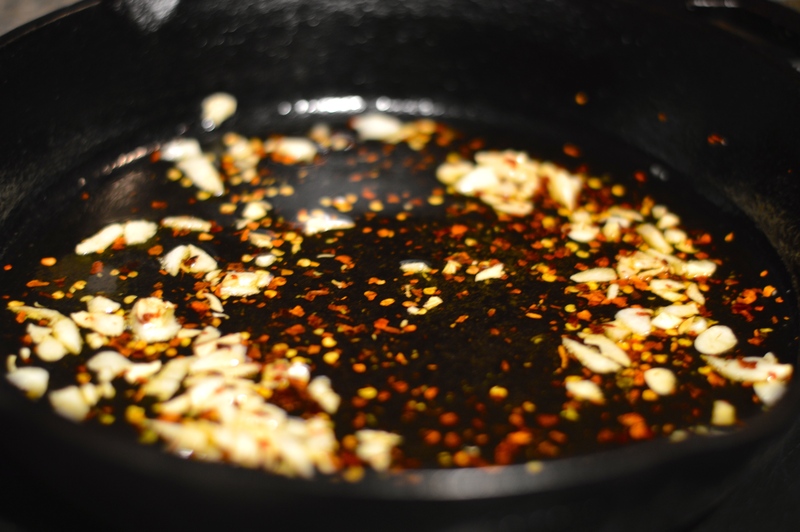 Mix and toss the pasta so that the spicy, garlicky oil gets well incorporated. If you are smarter than me, you’ll grate a little parmesan over the top just before serving. I bet that would work fine if you don’t want to do the saute part! Just toss your finished pasta with some olive, garlic salt and pepper and I bet it tastes great.